PLEASE MEASURE THE LENGTH OF YOUR TRUSSES BEFORE ORDERING Included: Metal ONE ( X ) TRUSS Bar Set (Exactly as shown in picture) No other parts Included. 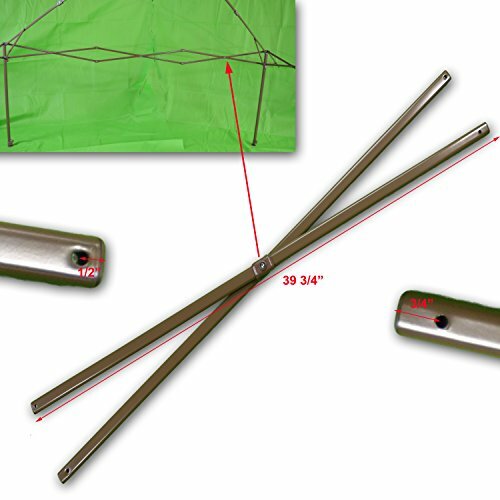 For Chapter 13' x 13' Padoga Instant Straight Leg Canopy Gazebo or any brand have same dimensions and specification PLEASE NOTE: This truss does Not attach to the Middle. It attaches on the corners as shown in picture. Dimensions: 39 3/4" x 3/4" x 3/8"
Included: Metal ONE ( X ) TRUSS Bar Set (Exactly as shown in picture) No other parts Included. PLEASE NOTE: This truss does Not attach to the Middle. Dimensions: 39 3/4" x 3/4" x 3/8"
If you have any questions about this product by Chapter Canopy Replacement Parts, contact us by completing and submitting the form below. If you are looking for a specif part number, please include it with your message.